War correspondents have long entered combat zoned at great personal risk, determined to capture the conflict for those on the home front. But during World War II, Toronto Star journalist Paul Morton found himself not just reporting the war but fighting his own personal battle in a shocking turn of events that led to disastrous consequences for his career. Morton volunteered in 1944 to parachute behind Nazi lines and report on the guerrilla war being waged by Italian partisans. But after he spent two months writing a series, the British Army changed its battle strategy and ordered stories on the partisans to cease. Morton's stories were "spiked," and he was discredited as a correspondent. Morton was subsequently fired by the Toronto Star after they unfairly claimed his reporting was fabricated. 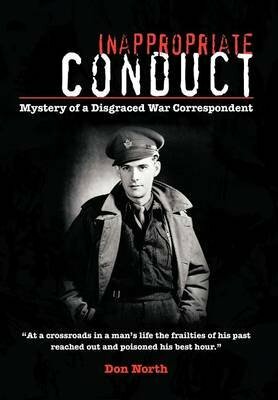 Eye-opening and gripping, Inappropriate Conduct shares the dramatic true story of how Morton became the target of a ruthless campaign that shattered his journalistic integrity and his career. Journalist Don North captures Morton's experiences from the beginning, using Morton's previously unpublished memoir and archival sources to create a seamless, powerful narrative that speaks to the tenuous relationship between the truth and propaganda during war.